This is an aerial view of the Korean World Trade Center Complex from the north. The Korean World Trade Center Complex is located in the Gangnam district, a new downtown in the southeastern part of Seoul. 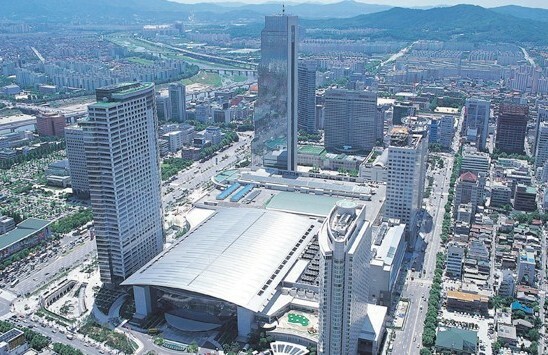 The COEX (convention and exhibition) center is the building with a big, shining roof in the above picture. Right next to the COEX center is the Korea city air terminal (KCAT). For more information about the local map within the Korean World Trade Center Complex, visit here. Check the Google satellite map around the COEX center. The main hall of the conference is room 401, the Grand Conference Room, which is located on the fourth floor of the COEX main building. The registration desk will position in front of Room 401. In the picture below the north is on the right. There are numerous Korean and international restaurants at the COEX mall which is located in the basement of the Korean World Trade Center Complex. Click here for the map of the Coex mall. The leaflet of the COEX mall will be available at the registration desk.